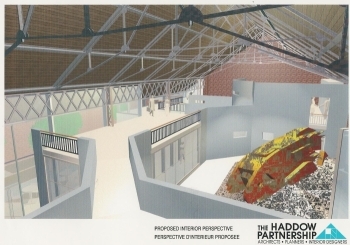 Various schemes have been proposed including a draft design offered by an architect, as shown below, to provide a more permanent building to house both the tank and collections. The tank was registered as a Historical French Monument on 14th September 1999. Thus the tank must be regarded much more as a monument, dedicated as a memorial to the Tank Corps, rather than an item of collection. There can be no restoration but a vigorous policy of preservation is in progress, which is the official requirement of the Ministry of Culture. At the moment the tank is under cover, but being an open barn, there is always the problem of condensation. A regular treatment with special oil helps to reduce any ulterior effect. Most of the inhabitants of Flesquieres take great interest in the project and offer both support and protection. The proposed scheme includes displays and dioramas explaining the Battle of Cambrai as well as the various collections already in existence. It is also planned to have an education room. Naturally it is hoped that the Museum project will be commenced in the not too distance future. The whole scheme is dependant on funding and support by others. In the meantime the tank and collections can only be viewed by previous arrangement by persons with a specific interest. Unfortunately very few visits can be accepted at the moment due to all the current and future work is being carried out by willing volunteers with a fervent desire to realise their longed-for goal.